If there is one thing in common among dog-lovers, it’s that we would give our right arm for them to be happy and healthy—literally. The same goes for their care. Whether it is boarding when we go on vacation and can’t take them with us, daycare so they aren’t lonely when we are at work, training to make sure they have the best manners or grooming to make them look and feel their best, we want them to have the best across the board. That’s where Champ’s Dog House comes in. 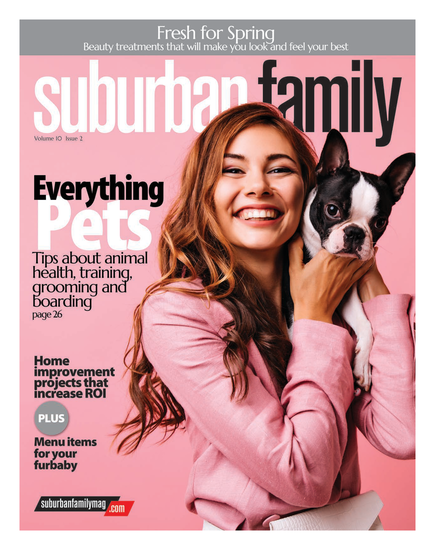 Suburban Family recently spoke with Jenna Quinn, co-owner (and professional dog petter), about how Champ’s Dog House came to fruition, the services they provide and why they will love your pet as much as you do. WHEN DID THE IDEA OF OPENING CHAMP’S DOG HOUSE COME ABOUT? I have had a crazy love for dogs for as far back as I can remember. On my first date with Pat, my now husband and co-owner, he asked me what my dream job was. I told him it was to be able to “pet dogs all day long.” Of course, we both got a good laugh at this but we did also start volunteering for our local animal shelter, got involved in animal advocacy groups and Pat started dog training. That was all about 13 years ago. In 2015, we decided to take the leap and live our dream, and with that our full-service facility Champ’s Dog House Medford opened. In 2016, we opened a stand-alone grooming salon, Champ’s Dog House Marlton, and in 2017, our K-9 Party Bus hit the road for mobile grooming. 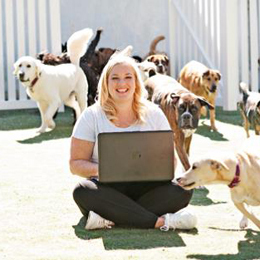 WHAT MADE YOU AND YOUR HUSBAND WANT TO OPEN A DOGGIE DAYCARE? I truly believe working in the pet care industry, specifically with dogs, is the greatest job in the world … who wouldn’t want to do it? I also firmly believe that the services we provide help keep dogs from ever hitting the shelter system. Happy, tired dogs, who have their biological needs met are usually not ending up in the shelter and that makes me so incredibly happy. WHAT SERVICES DO YOU OFFER BESIDES DAYCARE? We offer boarding, in-home puppy training, grooming and mobile grooming in select areas. WHAT DIFFERENT PERSONALITY-TYPES OF DOGS DO YOU SEE AT CHAMP’S? Across all services, we see all different types of dogs: hyper, shy, sweet, laid-back, nervous, excited— you name it. For daycare and boarding, every dog must pass a “first day” assessment and continue to show that they play well with others. HOW CAN ACTIVITIES DIFFER FOR THEIR DIFFERENT PERSONALITIES? We create our play groups based on temperament and different motivational techniques may be used for training based on their personalities. Champ’s Marlton and our K- 9 Party Bus are grooming-only so they are a great option for dogs that do best in a calm and very quiet atmosphere. HOW DO THEIR PERSONALITIES CONTRIBUTE TO THEIR TRAINING? Pat is our head trainer. He uses different motivational techniques to train your pups and get them excited to work with you, the owner. WHY SHOULD PET OWNERS CHOOSE CHAMP’S OVER ANOTHER FACILITY? At Champ’s, we not only love the amazing dogs, but we love our customers and our staff. Take a look through our Facebook photos at Champ’s Dog House, live videos and Instagram stories through @JennaFromChamps and @ChampionGroomers and you will see tons of pictures of happy dogs getting loved on by our staff. We really get to know both our dogs and their owners well—they are more than customers— they are like family to us. IT’S SAFE TO SAY YOU ARE DOG-LOVERS, DO YOU WORK WITH ANIMALS OUTSIDE OF YOUR BUSINESS? At our core, Pat and I are animal advocates. We spend a lot of time educating people on the importance of dog rescue/adoption and spay and neutering. We are also big supporters of United Against Puppy Mills and A Tail To Tell Rescue, both organizations based out of Lancaster, Pa. We foster and help place dogs for A Tail To Tell, it is very rewarding work that is extremely important to us. We also foster dogs and support local rescue, Joe Joe’s Place. If you’re looking for a new best friend we recommend starting with Joe Joe’s Place.